Bell peppers, tomatoes, cilantro, and lime add fresh flavors to this Hearty Pepper Chili; it’s filled with sausage, beans, and an abundance of vegetables. My entire family gave this meal two thumbs up. 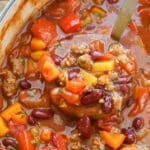 I’ve made this chili a couple more times already, just to have some stashed in the freezer for easy lunches. My kids have a well known and long lasting love for chili. So, when BUSH’S® Beans asked if I’d create a recipe for them, I jumped at the chance. My middle son, Ben, would probably eat chili for every meal of his eleven-year-old life if I gave him that option. So, when he saw me making this chili, I had a very willing helper at my elbows. I loaded this recipe with so many vegetables, I wasn’t 100% sure how well that might go over with them. Fortunately, they went crazy over the new recipe. Everything from “this tastes so fresh and I love the cilantro and lime” from my oldest to “I don’t know what’s different, but these bell peppers are great, Mom” from the youngest. Ben declared this chili the best one I’ve made in a long long time and said that we should make chili this way every time. I’m calling this a huge win for fresh vegetables and easy dinners. Kitchen Tip: I use this pot when making this recipe. Cook and crumble the sausage in a large pot over medium high heat. Add the onions to the skillet when the meat begins to brown. When the onions are tender, add the beans, bell peppers, tomatoes, and Mexican spices. Bring to a simmer until the peppers are tender, about 10 minutes. Remove from the heat, stir in the cilantro and lime juice. Scoop into bowls and garnish with the toppings of your choice. Enjoy! 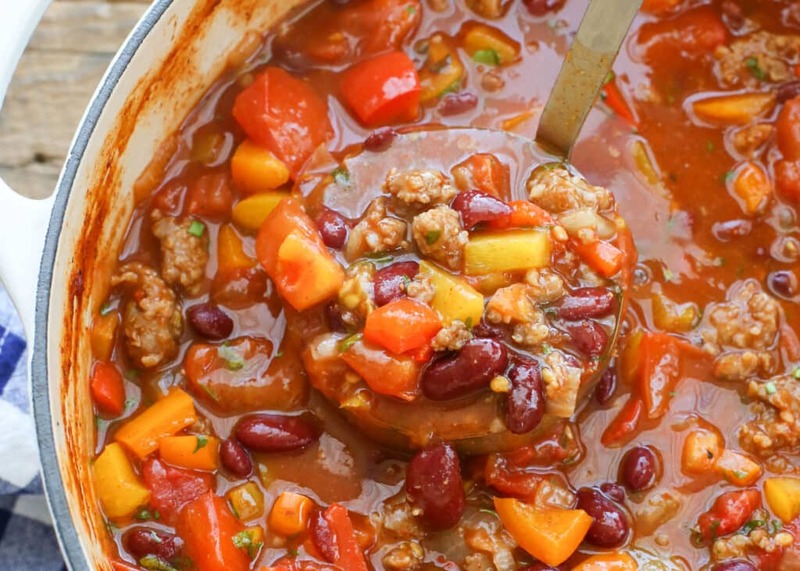 COOK’S NOTE: BUSH'S® Kidney Chili Beans are available in a Mild and a Spicy Chili Sauce. We like both varieties, but when I can find them, I like to use the spicier beans for an added kick. (2) 15-ounce cans of diced tomatoes may be substituted for the fresh tomatoes in this recipe. I typically use red, orange, and yellow peppers for this recipe, however any variety of bell pepper will work nicely. 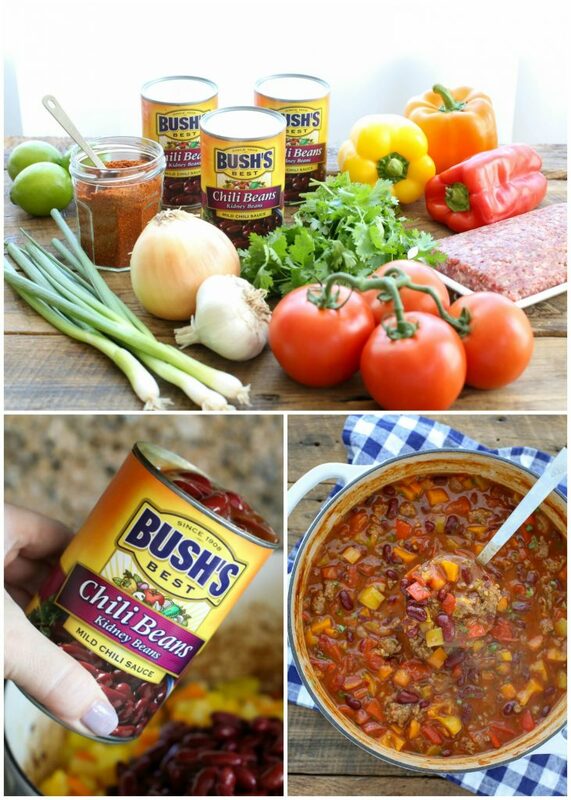 Disclosure: I’ve partnered with BUSH’S® Beans to share this recipe with you. Thank you for supporting the brands that make Barefeet In The Kitchen possible. As always, all thoughts and opinions are my own. THANK YOU. I am looking forward to Making this. I am a fan of lime and cilantro and veggies. It looks so pretty too. Why must cooks use pork products? Many of us can't eat pork and do not know what to use as a substitute. You can substitute ground beef or turkey sausage to replace the pork sausage in this recipe. Sorry about my curiosity. Mrs. Emerson. Why can't you eat pork? Making this for a group of ladies on Monday..Hope they like it.. I made a batch of this chili on Monday and it turned out great The lime and cilantro gave it a different flavor which I really did like. I didn't follow your recipe exactly because I forgot to get taco seasoning at the supermarket Also I used a mild Italian Turkey sausage instead of spicey (sold out). The other changes I made was I used 2 cans of the Kidney Beans and 1 Can of Black Beans in the Chili Sauce and 2 15 oz cans of diced fire-roasted tomatoes. For the taco seasoning I substituted chili powder, cumin, and oregano to taste. I cooked the sausage on the stove,added the onions and 2 small cloves of minced garlic and cooked until the onions were tender. .I used red,yellow,and orange sweet bell peppers and 1 diced jalapeno pepper Then I put it all in the crookpot abd simmered on high for about 2 hours. This is definitely a keeper and will add it to my Soup and Stew recipe file. Thank you so much. Hello, I am planning to make this chili recipe this afternoon. 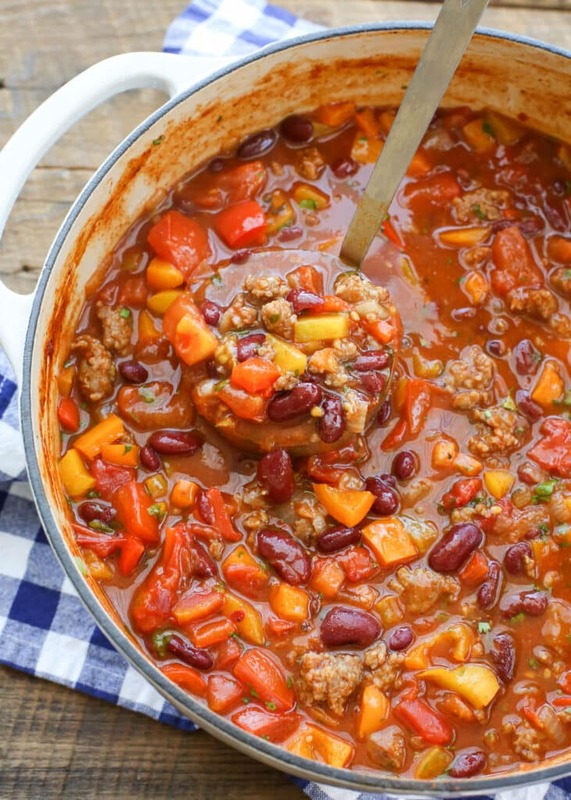 My husband and his buddies did a 3 day backpacking trip in the cold and rain and I’d like this warm, spicy chili to greet them when they walk in the door. My question though, is where is the liquid? After browning the sausage and softening the onions, the recipe says to add the beans, pepers, tomatoes, and seasonings, then simmer. Simmer in what? Do the tomatoes throw off the liquid? Or add water? Chicken stock? I do not make soup or stew often....I feel like I am missing something. The tomatoes and the beans will add plenty of liquid. Enjoy! LOVE LOVE LOVE this recipe! My family raves every time I cook it!